Opel believes the new Corsa OPC will ‘raise the bar for small, fast hatchbacks’ when it arrives in Ireland later this year. The German car manufacturer release pictures of the new model ahead of its launch at the Geneva Motor Show next month. The new 1.6-litre 207hp turbocharged model can accelerate from 0-100kph in 6.9seconds and has a top speed of 230kph. Opel puts combined fuel consumption at 7.5-litres/100km. CO2 emissions are 174g/km. The Corsa OPC sits 10mm closer to the ground than the regular Corsa. It also features a two-stage switchable electronic stability programme and traction control. Opel says the car’s steering has been revised, making it ‘more direct and precise, with improved feedback through the wheel’. Six exterior colours will be available, including Flash Blue, which is unique to the Corsa OPC. The cabin also features a leather, flat bottomed steering wheel, Recaro seats, sports pedals and OPC gear-lever and instruments. The windscreen is heated and the IntelliLink infotainment system is standard. Managing director of Opel Ireland, Dave Sheeran said: ‘Our OPC models are the dynamic spearheads of our car ranges. ‘They reflect Opel’s sporting heritage, epitomise quality German engineering, emotional design and distinctive driving dynamics. 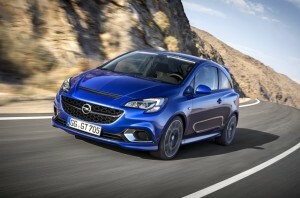 The new Opel Corsa OPC is expected in Ireland this summer. Further details will be announced in Geneva.